A business-aligned security leader is vital to the success of an organization’s information security program. 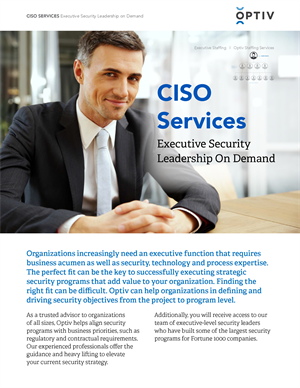 Whether you are a business leader in search of a business savvy security executive, or a present CISO in need of a trusted advisor to provide executive, board-level support, Optiv’s CISO services are tailored to meet your needs. As a trusted advisor, we help align security programs with business priorities and regulatory requirements.